SMW Series 4 – MoonFigures Collection, Art, and Reviews! As each new series is released the quality improves in these figures. These are, yet again, wonderful quality figures. While there are some stance issues with Sailor Moon and Chibi Moon, they’re typically easy to deal with. I found fiddling with their stands eventually lead to finding a position that allowed them to stand freely on their own. Sailor Moons works better if it’s fit to her inside ankle.You may also have to fiddle with Makoto’s stand every so often to position her. Once again, the paint is well done, and the figures themselves are true to their characters. We have 2 additional characters added to the “swimsuit collection”. 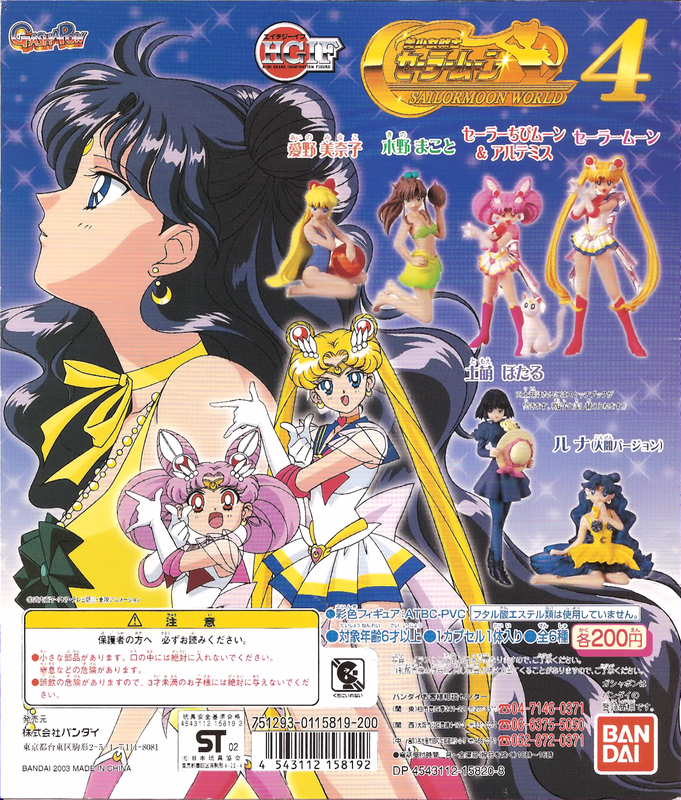 Sailor Moon may need her bows glued, or handled carefully, as well as her arms. With this set I specifically like the customizable features with Hotaru. Her shawl is removable, and she comes with interchangeable pieces for her to hold (a school book, and hat). If carefully positioned, she can hold both. 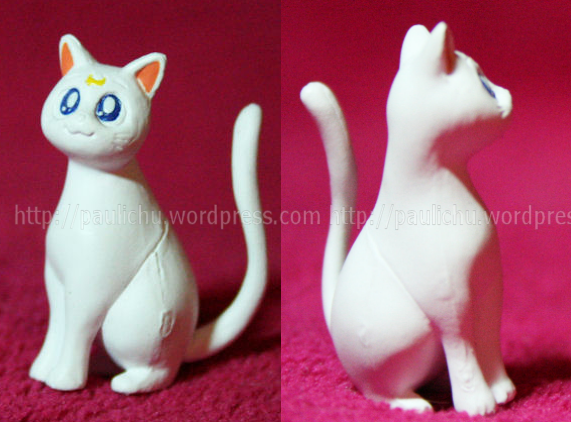 Human!Luna is also exceptionally well crafted and beautiful. There are several details such as her anklet, and transparent skirt and hair that make her all the more sought after. 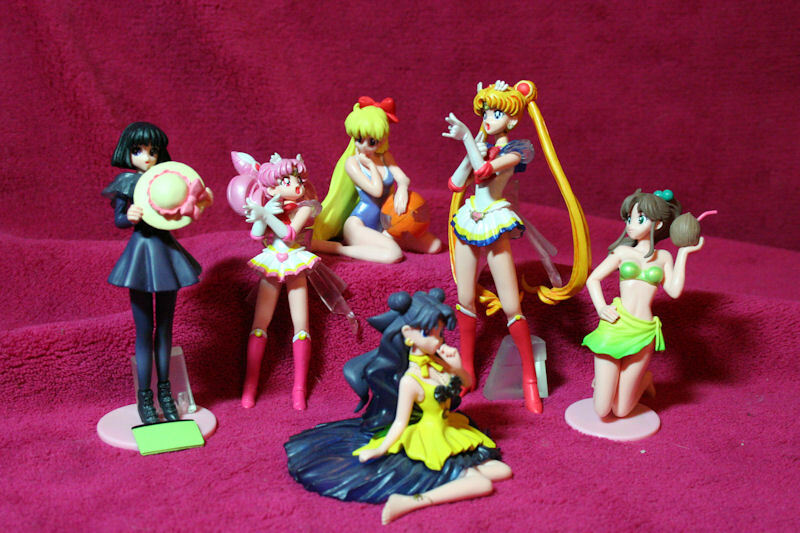 This set includes Super Sailor Moon, Super Sailor Chibi Moon, Hotaru Tomoe, Swimsuit!Minako, Swimsuit!Makoto, Artemis (not pictured) and Human!Luna. As far as I know there are no bootlegged versions of this set available. Some of the figures which do not have pictures of the copyright probably have the information on the bottom of the pink stands provided with the figure. On March 3, 2011 I snagged a cardboard advertisement on Ebay for these figurines. There is a scan of it above. It is the same as the ad I posted for Series 2. The ad made it to me exactly 20 days later and I’ve wrapped it securely and have it displayed with my gashapon. Highly recommended if you can find them.